Je Nepomuceno was sexually abused nearly 25 years ago as a little girl in the Philippines. She finds strength in singing and sharing her story with others. Photo by Jon Lowenstein. The heavy smells of hot concrete and leather clung to the 9-year-old girl as she walked through the small alley near her family’s shoe factory. Je Nepomuceno always spent the humid Philippine summers working there, folding shoe boxes and playing with her cousins. One afternoon, without warning, a figure appeared in the alley–”a worker from the factory she barely knew. His large hands grabbed her and held her by her chest and thrust her toward a nearby hut, and all Nepomuceno could do was walk along with him, submitting to the confusion. In the hut, Nepomuceno became a victim of sexual abuse. Being abused rocked the solid and loving foundation her family had established. It stripped her self-confidence, alienated her from her body as she grew into womanhood and drained her will to fight for herself when she was in a physically abusive relationship five years later. Drenching her in self-blame, the abuse kept her silent for nearly 20 years. “I felt like I was a freak,” she says. But in the past five years, through the help of a group of fellow artists, Nepomuceno has regained her voice and started to share her experience with family members, her circle of friends and others in the community. She has written a song in her native Tagalog about her experience and conducts youth workshops in which participants can choose to explore issues of child sexual abuse. 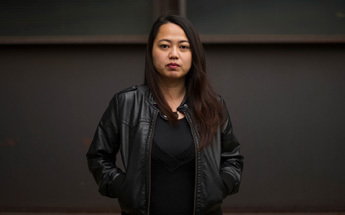 In these ways, she works to puncture the silence and release the shame that so often affects survivors of child sexual abuse from all backgrounds, but particularly in Asian immigrant families. “Now is the time for me to be vocal about it,” she says. Nepomuceno’s frank talk is unusual. On the county and state level, there were fewer calls alleging abuse of Asian children than their share among the population, according to a Chicago Reporter analysis of the Illinois Department of Children and Family Services data on child sexual abuse allegations between 2005 and 2009. In Cook County, just 1 percent of the calls alleging child sexual abuse were about Asian children, who made up 5 percent of the county’s 1.3 million residents younger than 18 in 2008. And of the 220 calls alleging sexual abuse of Asian children in the county, just 10, or 5 percent, came from relatives and neighbors. By contrast, 15 percent of the calls about black children came from those same sources. The figures were similarly low at the state level. Asians made up close to 4 percent of the state’s 3.2 million people younger than 18, but just 0.47 percent of the calls were about them. Youngju Ji, executive director of Korean American Women in Need, a nonprofit based in Des Plaines that is dedicated to building safe and healthy communities, said the issue of child sexual abuse is a major one among Asian communities but one that is rarely addressed in an open fashion. In 2001, a study published in Clinical Psychology: Science and Practice discussed how Asians generally hold more collectivist attitudes–”focusing on the family, business or state before the self versus the more Western individualist approach. This emphasis on the harmony of the group over the needs of the individual may cause Asian Americans to swallow the pain of abuse in order to safeguard a family’s reputation and well-being. This tendency can become accentuated among immigrant families in a new and different country as they are increasingly reliant on other family members for financial survival, Ji said. The 2001 study also noted that “sexuality is generally considered a taboo topic for discussion in Asian-American culture,” and talking about it is “extremely embarrassing and awkward for this population.” The lack of reporting and communication combines to create a fiction that child sexual abuse doesn’t exist within the community. Lisa Aronson Fontes, a psychology professor at the University of Massachusetts at Amherst, and author of “Child Abuse and Culture,” said that for many non-English speaking parents, lack of resources in their language and lack of knowledge about whom to call may constitute a barrier to calling. In its procedures about child sexual abuse, DCFS calls for the provision of Spanish-language speakers, even though some service providers say that in practice the presence of Spanish speakers has been erratic. Service providers said the availability of services for people who speak neither Spanish nor English is spotty and dependent on individual workers. Anne Pezzillo, manager at the RISE Children’s Center, which provides support and resources for victims of sexual violence, cited the example of a Vietnamese counselor who worked with the Asian population, but the center’s effort fizzled after the counselor left. These barriers animate Nepomuceno’s commitment to share her experience and help the community confront what happens to too many of its young and most vulnerable members. A number of her friends having young girls intensifies her drive. Nepomuceno’s work takes different forms. Along with other members of the Bagwis Collective, she has written and recorded an acoustic guitar song recounting her experience, called “Nena,” a common name for a young girl in the Philippines. She asked her father to translate the work into English so that he would face what had happened to her. She also holds “Decolonizing the Body” workshops in which youth can discuss issues of sexual abuse if they feel comfortable doing so. Nepomuceno emphasizes that she strives to create a safe environment for the participants and to avoid using the workshop as a vehicle for her to wage her own personal struggle. Nepomuceno can speak about the abuse with less anger than she did in the past. She has released most, if not all, of the self-blame and has come to understand that anyone who abuses children has the problem, not the victim. Close to a quarter century after the abuse, Nepomuceno realizes that she still does not understand all of its effects on her. Her efforts to open conversation with other members of the Filipino community are often met with polite silence. And she knows she needs other people to work with her if they are to make a dent in the problem and to keep other girls from experiencing what she endured nearly 25 years ago. “I would need young women to work with young men, work without judgment, so that we are able to help our girls,” she says.